Pontiac Solstice Forum > Technical Solstice Discussion > General Tech, Platform Common Issues & Solutions > CEL P0327 where is the knock sensor located? Hey everyone, first I want to start off by saying thank you for taking the time to read this and if you offer advice I very much appreciate that as well. Over the winter I had stored my 2009 solstice and when the the weather became nicer finally pulled out the car. Unfortunately the battery had died from sitting but I was able to jump it right away. I took the car for a drive and about 10 minutes in a check engine light came on. When I got back to my house I checked the code and it through a P0327 Knock Sensor 1 Circuit Low Input (Bank I or Single Sensor). The car has just over 124,000 miles and has been very well maintained. The only mod I put on the car was an intake and that was almost 9 months ago. While having the intake I had no issues. 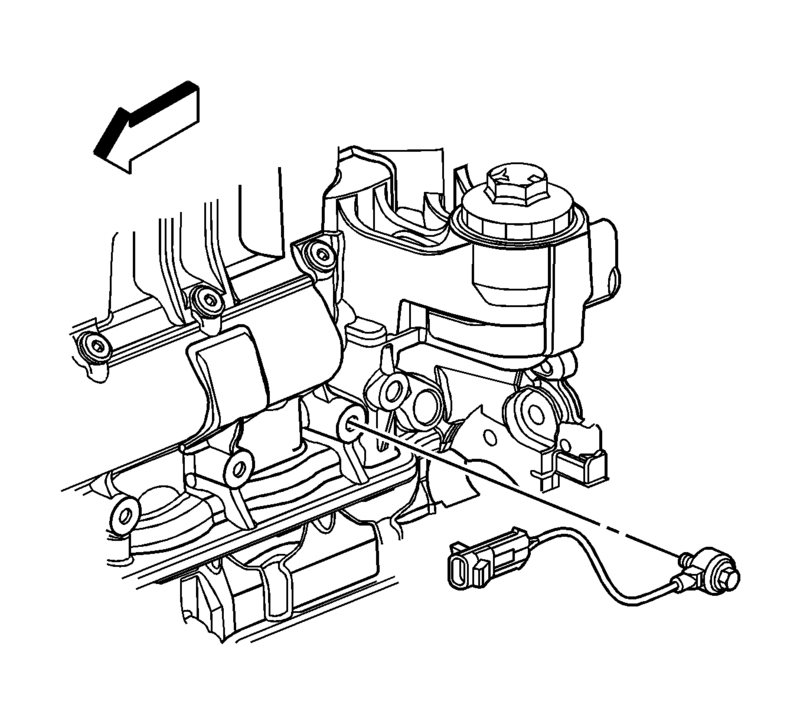 I'm having a really hard time finding a diagram or drawing showing the location of the knock sensor. Does anyone have a drawing that I could use or could tell me where it is located? Also has this been an issue for anyone else? If so how did you go about fixing it? If anyone could provide any information I would be extremely grateful. This car it's the one thing I own that is actually nice. I cherish it dearly and want to keep it as perfect as possible. Again thank you for taking the time to read this, and thank you in advance for any information! Edit: I should mention I have the 2.4 engine. Sorry about leaving that info out. Last edited by Gerstech; 03-22-2019 at 04:33 PM. I would suspect the gasoline might be the problem. I'd suggest adding a quality octane booster and only run high test. Others here who store their cars have posted great advice concerning this issue. No doubt one of them will jump in and help you out with what you need. My daughter had the same problem with her KIA and knock sensor codes. High octane fuel solved the problem. Hi, thank you for the quick response. That's actually the first thing I did. Unfortunately I had half a tank of gas. I ended up filling it up with 93 and put in a fuel treatment. I had cleared the code before doing this and eventually it came back on. I thought about running the car until it was on empty and then filling it up with 93 and putting in a different type of fuel treatment. But I've read online that if there is a actual issue that the knock sensor is recognizing it could be extremely dangerous for the engine so I'm a bit wary about driving it. This certainly could be the case because I was using regular instead of Premium. I usually always put in the better fuel but before I put it away for the winter the last couple times I filled it up it was with regular. Go to the search engine on the right top of the home page and look for any threads that have to do with the knock sensor there are a couple . How old is your battery ? if it's over 5 years it could be time for a new one when the batteries start to go on these cars they can throw some strange codes . As for the fuel issue there have been members who let there cars sit all winter with no additives and have no problems about 95 % of the octane boosters out there are a waste of money you did the right thing by adding a fuel system cleaner . Is your car a GXP if so you should be running at least 91 octane all the time Good Luck ! I'll second the fuel comment. I have always run regular grade fuel in my NA, and last year went a full year between fill-ups with no problems from either. My un-tuned RL has no problems running mid-grade fuel, and went three months between fill-ups last fall, also with no problem. That's not to see you couldn't have gotten some bad fuel, but assuming good fuel what you did should be fine. On that note, you might think about siphoning or pumping the tank dry, then putting in some fresh fuel to see what happens. P0327 implies that the sensor isn't working properly. That doesn't necessarily indicate that your engine is knocking - just that it can't tell. IIRC, the sensor on the 2.4 is just above the starter, below the intake manifold towards the rear of the block. It's not hard to change, but the best way to get to it is to remove the intake manifold. Since you already have an intake, that should be pretty straightforward. The intake manifold is held on by 8 to 10 (working from memory here) 10mm nuts and bolts. Unlike the LNF intake manifold, it comes off pretty easily. If this is an LNF (GXP) - your message doesn't say - then it gets more complicated as removing THAT intake manifold is a horrendous pain in the posterior. But, the knock sensor should be in the same location. 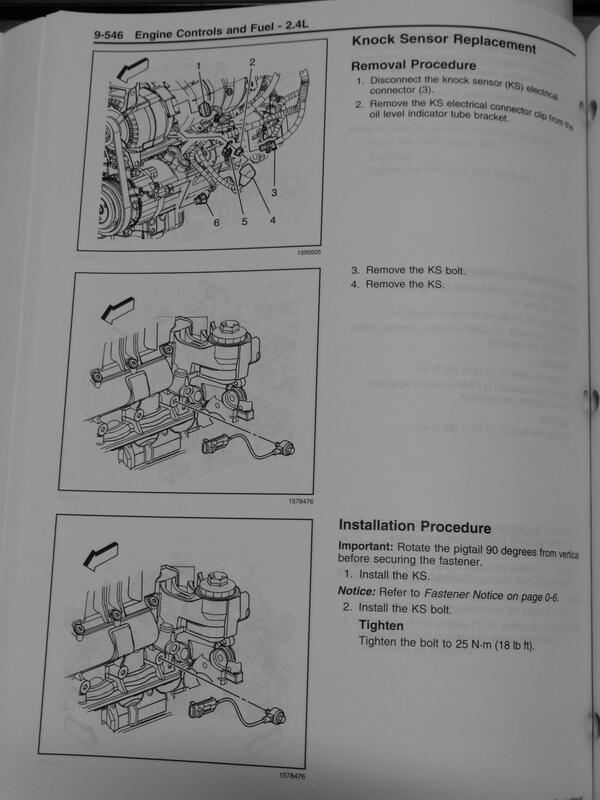 If it's an LNF, go ahead and inspect the intake valves for carbon buildup while you have the manifold off. Here's where it's located on the 2.4 (See attachment). Last edited by raygun; 03-22-2019 at 11:40 AM. If it is the sensor not working, it could be a connection. It would definitely be worth cycling all of the connectors between the ECM and the knock sensor. Flooded? Is that from another thread I missed? For what it's worth you cannot siphon gas from a Kappa I tried there is something in the filler neck that blocks a siphoning hose from going down if it indeed is bad gas the combination of high test and fuel system cleaner should solve that issue . Thank you everybody for commenting and helping. I really appreciate it. I'm happy to be part of a community where members come together to help. I'm going to take a look at it tomorrow to see if I could find out if the sensor is bad. A buddy of mine recommended me putting a meter on the sensor and seeing what it is drawing. Would anyone happen to know how many volts that sensor should be pulling? Hi, thanks for your advice! I just checked the battery to see if there was a manufacturing date sticker on it like most batteries have. Unfortunately there wasn't one. It is safe to say the battery is probably 3 years old at least. Also I have the 2.4 engine. Thanks again! You must have been waiting for me to post. I edited that as soon as it went up (as you can see from the quoted text) and yes, I was in two threads at the same time and got my wires crossed. I have attached the relevant pages for this code. It is caused by a short to ground and can be caused by the KS, the ECM, or the wiring between them. 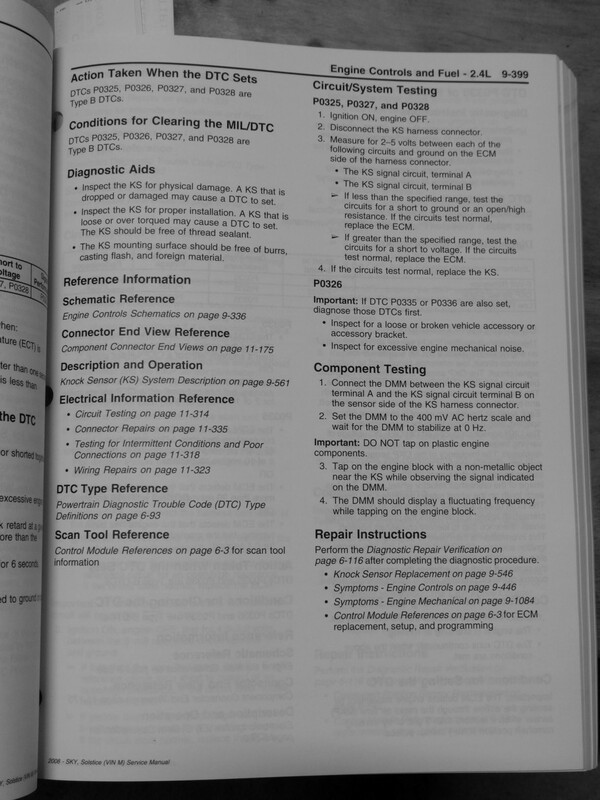 The third page is the replacement procedure. Last edited by JohnWR; 03-22-2019 at 06:01 PM. Thank you very very much for the information! That is extremely helpful. 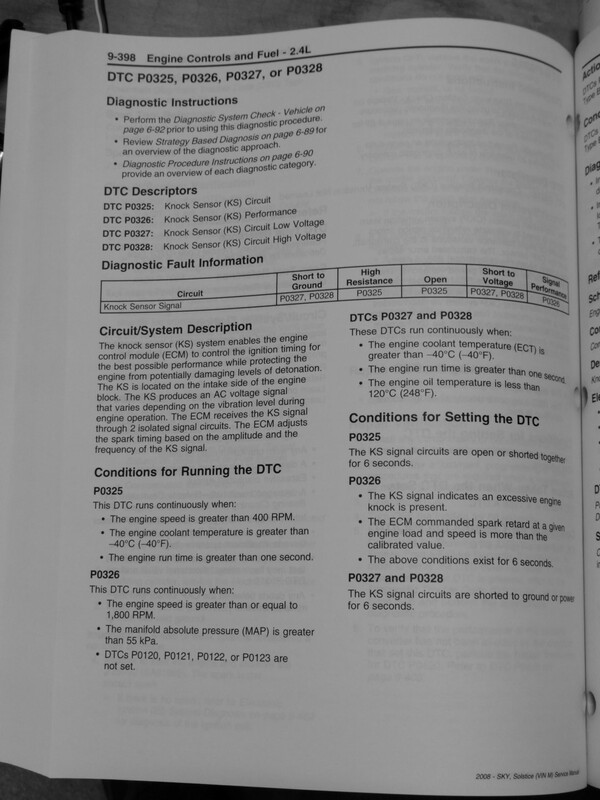 I have one question would you happen to know what the torque specs are? I wasn't able to find any info online I got the knock sensor and I also got the gaskets for the intake manifold. I didn't know that the gaskets for this car are unlike gaskets of older cars. I'm so used to working on cars that have one piece gaskets instead of the individual rubber styled gasket that the Solstice has. This design is definitely interesting. The torque is 25 N-m or 18 lb-ft. There is a specific note to not use thread locker, lubricant, or anti-seize. Last edited by JohnWR; 03-30-2019 at 08:57 PM.